Challenger is your first choice for yellow French fries, known for its golden crisp bite and excellent balanced taste. 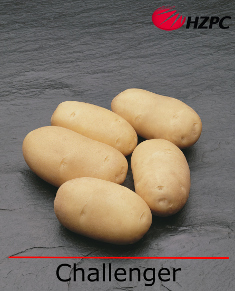 Challenger is a premium quality potato suitable for both French Fry processing and the fresh market. Challenger has a relatively high tuber set and high yield potential. Tubers are oblong and medium-large in size. Challenger is a medium late maturing variety and has a strong foliage development. Fertilizer rate is comparable to other maincrop processing varieties and planting distance should be at least 12 inches apart. Challenger has great texture with uniform and consistently good fry colours. Challenger also stores well for long periods and maintains stable sugars. The truly multi-functionality of this variety has and already gained notoriety in the market.